Crude SOYBEAN oil is obtained from SOYBEAN seeds which go through the preparatory steps before undergoing solvent extraction process. The crude SOYBEAN oil is further refined for making it free from fatty acids, color pigments and numerous other components harmful to human beings. Crude soybean oil contains a relatively high concentration of phospholipids compared With other vegetable oils. 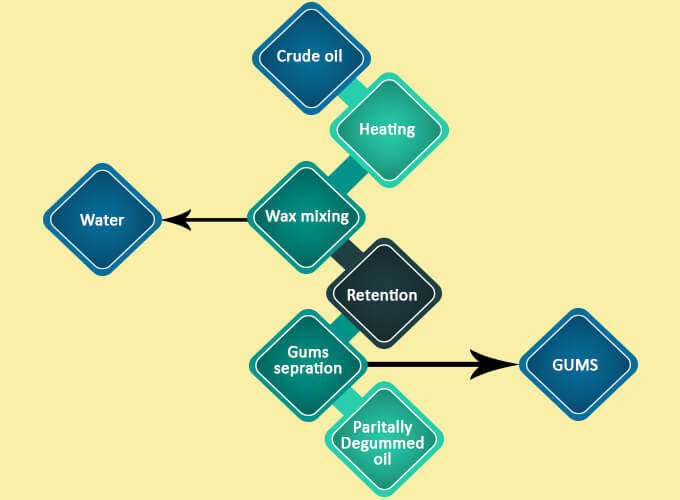 Degumming is a process of removing these components From crude soybean oil to improve its physical stability and facilitate further refining.In this process oil is treated with water to precipitate the hydratable phosphorous which removed through the centrifugal separation system and obtained gums is dried to make lecithin which is used in many applications in food industry. Degummed oil received is treated with phosphoric acid in to a suitable retention tank to convert non hydratable phosphorus in to hydratable form. 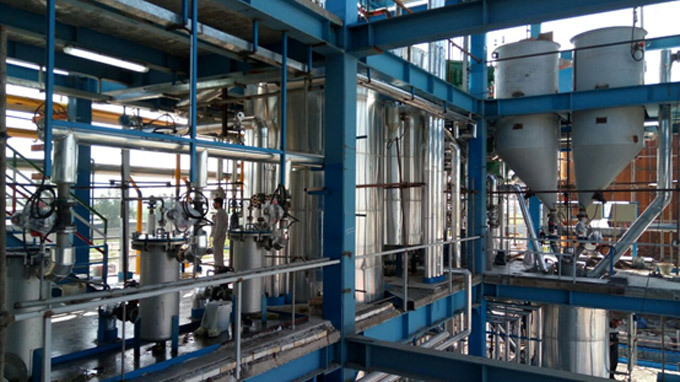 After the completion of above process acid mixed oil is treated with caustic soda lye in another retention vessel to neutralize the fatty acids and phosphoric acid as well. 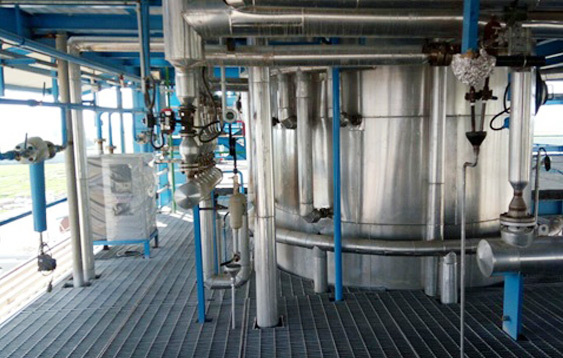 Once retention time is completed, oil and soap is separated in centrifugal separator. Neutralized and soap separated oil further treated with hot water to remove the traces of soap which was not fully separated in previous process. 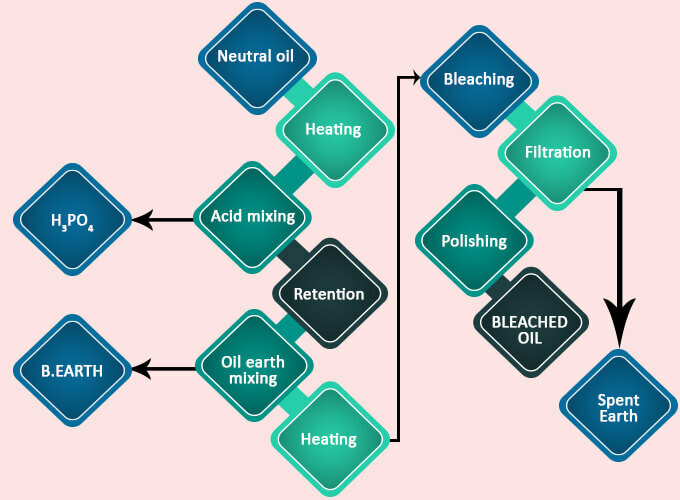 Neutralized oil first heated and treated with 10-15% hot water in dynamic mixer and send in to centrifugal separator to separate the soap mixed water from oil. Washed oil is dried in to vacuum drier at 80 mbar pressure in which water is sucked by vacuum and clear oil transferred in to Neutral oil storage tank. Finally the washed oil is transferred to the neutral oil storage tank after drying it through vacuum. Deaeration - this process is conducted in Deaerator at a standard temperature under high vacuum. At first, the oil is charged and sparge steam is used for the removal of air traces which is further sucked through a vacuum. Heating - the process of heating is conducted in a heater that is specially designed for functioning under the very low pressure. 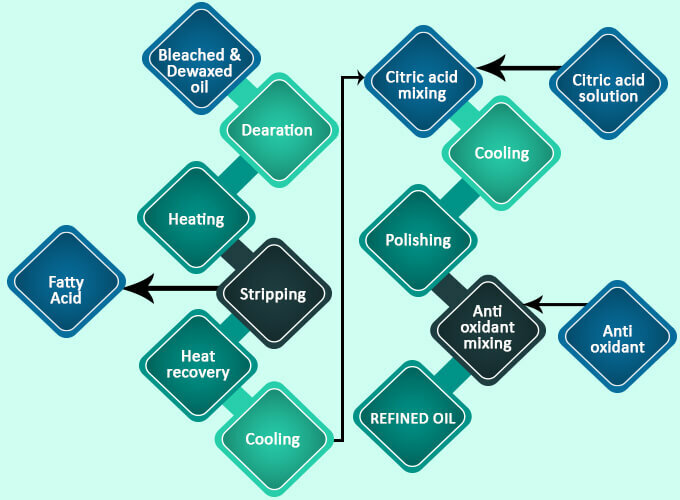 Striping - this process is carried out at a high temperature for the removal of odoriferous compounds as well as the fatty acids from the oil via stripping steam. Cooling - in this step the temperature of the oil is reduced by the heat exchange with feed oil and followed by clean water through special designed heat exchangers. 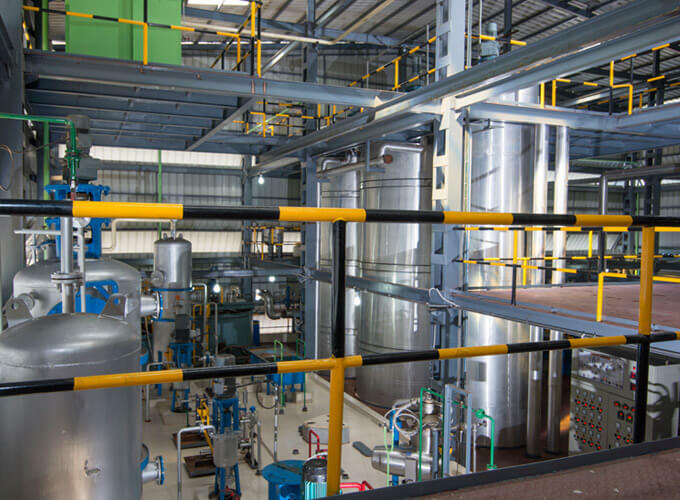 Further, the temperature of oil is brought to the required level and required quantity of anti-oxidant dosing is added in to oil after which the oil is transferred to the storage tank through a polishing filter. 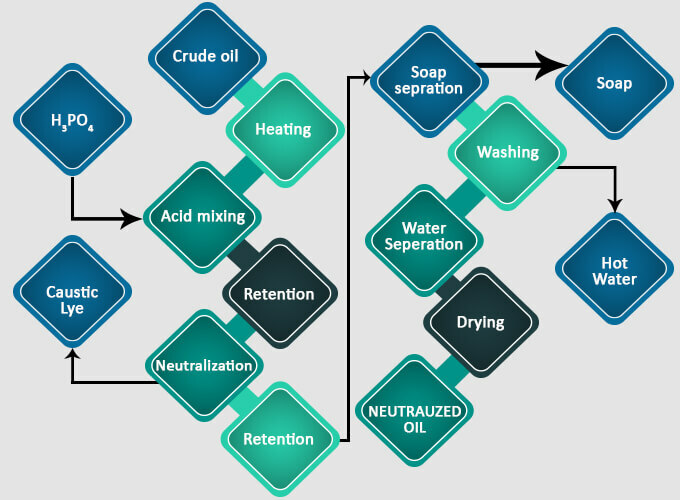 Mectech’s neutralization process is highly efficient, neutralization of fatty acid is accomplished with minimal saponification and the phosphorous content in neutral oil is also very low. The caustic lye mixer provides an outstanding contact amid oil and caustic lye. This ensures the low consumption of caustic lye in entire neutralization process. In addition, the variable residence time provided by the caustic and oil retention tank ensures the minimum loss of neutral oil. The bleacher designed by Mectech are highly efficient as they do not require any mechanical agitation as well as accomplish the process of bleaching under optimum moisture for achieving perfect results. In addition, our highly efficient bleachers also consume low bleaching earth and also save the power consumed for running the process. Apart from bleachers, our oil to oil heat exchanger which is an eminent part of deodorizer is also uniquely designed for the consumption of minimum heat energy. The fatty acid scrubbing recovery system in deodorizer has an efficient and elaborate design which ensures that virtually there is no carry-over of the fatty acid in the barometric condenser. Heating coil is also very efficiently designed with the aim of preventing charring of oil.